"PHL" redirects here. For other uses, see PHL (disambiguation). "Philadelphia Airport" redirects here. For other airports serving Philadelphia, see List of airports in the Philadelphia area. For the airport in Mississippi, see Philadelphia Municipal Airport. Philadelphia International Airport (IATA: PHL, ICAO: KPHL, FAA LID: PHL), often referred to just by its IATA code PHL, is a major airport in Philadelphia, Pennsylvania, United States, and is the largest airport in the state. The airport is the main Northeast hub for American Airlines and a regional cargo hub for UPS Airlines. Philadelphia International Airport is also a focus city for ultra low-cost airline Frontier. The airport has service to destinations in the United States, Canada, the Caribbean, Latin America, Europe, and the Middle East. As of summer 2018, there are flights from the airport to 133 total destinations, including 97 domestic and 36 international destinations. Most of the airport property is located in Philadelphia proper. The international terminal and the western end of the airfield are located in Tinicum Township, Delaware County. PHL covers 2,302 acres (932 ha) and has 4 runways. 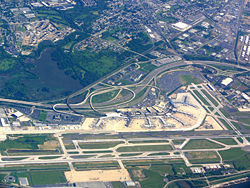 Philadelphia International Airport is important to Philadelphia, its metropolitan region and the Commonwealth of Pennsylvania. The Commonwealth's Aviation Bureau reported in its Pennsylvania Air Service Monitor that the total economic impact made by the state's airports in 2004 was $22 billion. PHL alone accounted for $14 billion or 63% of the total. The calculations include both direct spending and the multiplier effect of that spending throughout the state's economy. Starting in 1925, the Pennsylvania National Guard used the current airport site (known as Hog Island) as a training airfield. The site was dedicated as the "Philadelphia Municipal Airport" by Charles Lindbergh in 1927, but it had no proper terminal building until 1940; airlines used the airfield (at 39°55′48″N 75°04′41″W﻿ / ﻿39.930°N 75.078°W﻿ / 39.930; -75.078) in nearby Camden, New Jersey. Once Philadelphia's terminal was completed (on the east side of the field) American, Eastern, TWA and United began flights. In 1947 and 1950, the airport had runways 4, 9, 12 and 17, all of 5400 ft or less. In 1956 runway 9 was 7284 ft; in 1959 it was 9499 ft and runway 12 was closed. Not much change occurred until the early 1970s, when runway 4 was closed and 9R opened with 10500 ft.
On June 20, 1940, the airport's weather station became as the official point for Philadelphia weather observations and records by the National Weather Service. Beginning in 1940, the Coatesville-based Rising Sun School of Aeronautics performed primary flight training at the airport under contract to the Air Corps. After the Pearl Harbor Attack, the I Fighter Command Philadelphia Fighter Wing provided air defense of the Delaware Valley area from the airport. Throughout the war, various fighter and bomber groups were organized and trained at Philadelphia airport and assigned to the Philadelphia Fighter Wing before being sent to advanced training airfields or being deployed overseas. Known units assigned were the 33d, 58th, 355th and 358th Fighter Groups. In June 1943, I Fighter Command transferred jurisdiction of the airport to the Air Technical Service Command (ATSC). ATSC established a sub-depot of the Middletown Air Depot at the airport. The 855th Army Air Forces Specialized Depot unit repaired and overhauled aircraft and returned them to active service, and the Army Air Forces Training Command established the Philco Training School on January 1, 1943, which trained personnel in radio repair and operations. During 1945, the Air Force reduced its use of the airport and it was returned to civil control that September. Philadelphia Municipal became Philadelphia International in 1945, when American Overseas Airlines began direct flights to Europe. (For a short time AOA's flights skipped the New York stop; that was probably Philadelphia's only international nonstop until Pan Am tried nonstops to Europe in 1961.) A new terminal opened in December 1953; the oldest parts of the present terminal complex (B and C) were built in the late '50s. The April 1957 OAG shows 30 weekday departures on Eastern, 24 TWA, 24 United, 18 American, 16 National, 14 Capital, 6 Allegheny and 3 Delta. To Europe, five Pan Am DC-6Bs a week via Idlewild and Boston and two TWA 749As a week via Idlewild; one TWA flight continued to Ceylon. Eastern and National had nonstops to Miami, but the TWA 1049G to LAX (started 1956) was the only nonstop beyond Chicago. Terminal B/C modernization was completed in 1970, Terminal D opened in 1973 and Terminal E in 1977; the $300 million expansion was designed by Arnold Thompson Associates, Inc. and Vincent G. Kling & Associates. In the 1980s, PHL hosted several hubs. The Airline Deregulation Act of 1978 allowed regional carrier Altair Airlines to create a small hub at PHL using Fokker F-28s. Altair began in 1967 with flights to cities such as Rochester, New York, Hartford, Connecticut and to Florida until it ceased operations in November 1982. In the mid-1980s Eastern Air Lines opened a hub in Concourse C. The airline declined in the late 1980s and sold aircraft and gate leases to Chicago-based Midway Airlines. Midway operated its Philadelphia hub until it ceased operation in 1991. During the 1980s US Airways (then called USAir) built a hub at PHL. US Airways became the dominant carrier at PHL during the 1980s and 1990s and shifted most of its hub operations from Pittsburgh to Philadelphia in 2003. As of 2013[update] PHL was US Airways' largest international hub. From January 2013, the lease agreement underlying US Airways operations at PHL expired at the end of June 2015. In July 1999, the Pennsylvania Department of Transportation (PennDOT) and several U.S. federal government agencies selected a route for the connecting ramps from the northbound and southbound portions of Interstate 95 to the Terminal A-West complex, then under development; the agency tried to avoid the John Heinz National Wildlife Refuge at Tinicum. However K/B Fund II, the owner of the International Plaza complex, formerly the Scott Paper headquarters Scott Plaza, objected to the proposed routing. K/B Fund II argued that the proposed routing would interfere with the International Plaza development. It entered a filing in the U.S. Court of Appeals for the Third Circuit to challenge the proposed routing. In 2000, the airport attempted to acquire the complex for $90 million but Tinicum Township commissioners stopped the deal from going forward, citing concerns of a loss of tax revenue for the township and the Interboro School District, which serves Tinicum, as well as noise pollution concerns. In 2002, construction on the controversial new entrance ramps went forward. The new ramps eliminated the traffic signal and stop intersections previously encountered by northbound I-95 motorists who had to exit onto Route 291 to reach the airport. The project consisted of six new bridges, more than 4,300 linear feet of retaining walls, and 7.7-lane miles of new pavement. The project also included new highway lighting, overhead sign structures, landscaping and the paving of Bartram Avenue. Also under the project, PennDOT resurfaced I-95 between Route 420 and Island Avenue and constructed a truck enforcement and park-and-ride facility. In 2003, Terminal A-West opened to passengers; the terminal was complemented by a 1,500-space parking garage. Construction of the terminal was funded with proceeds from airport revenue bonds that were sold by the Philadelphia Authority for Industrial Development. By 2005, there were two studies that dealt with expanding runway capacity at PHL: the Runway 17–35 Extension Project EIS and the PHL Capacity Enhancement Program EIS. Completed in May 2009, the Runway 17-35 Extension Project extended runway 17–35 to a length of 6,500 ft (2,000 m), extending it at both ends and incorporating the proper runway safety areas. Other changes made with the Runway 17–35 Extension Project included additional taxiways and aprons, relocation of perimeter service roads, and modifications to nearby public roads. The status of Philadelphia International Airport as a major international gateway for American Airlines and the growth of Southwest Airlines and other low-cost carriers have helped passenger traffic to reach record levels in the mid-2000s. In 2004, a total of 28,507,420 passengers flew through Philadelphia, up 15.5% over 2003. In 2005, 31,502,855 passengers flew through PHL, marking a 10% increase since 2004. In 2006, 31,768,272 passengers travelled through PHL, a 0.9% increase. 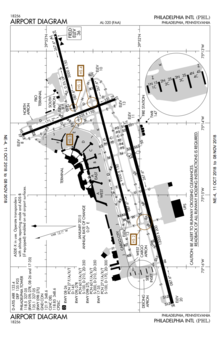 At 12,000 feet (3,658 meters) in length, runway 9R/27L (previously was 10,506 feet) is the longest commercial runway in the state of Pennsylvania. The airport's present terminal and runway layout are reaching full utilization and PHL remains the world's largest airport without an inground fueling system thus requiring fuel to be trucked to each airplane. These two factors have led to congestion and delays. Additionally, the airport's parking facilities have been severely taxed. Exhaustion of all 17,000 parking spaces at the airport has become a regular occurrence. However, airport officials have ambitious plans for terminal and runway expansion. The Capacity Enhancement Program has a much larger scope and is considering more drastic ways to increase runway capacity. On December 30, 2010, a 13-year $5.2 billion project that would have extended the two main runways and added one new runway was passed by the FAA. The project would also create two new passenger terminals, the first terminal will be built where the current terminal complex is located and the second terminal will be built across from the current terminal complex. The project was also going to relocate the UPS facility and redevelop cargo city, the cargo complex at PHL. The redesigned UPS facility would have required demolition of several houses of nearby Tinicum Township. But after much resistance by the residents of those homes, an agreement was made to keep the homes and expand the airport elsewhere. The new project will now cost $6.4 billion. Southwest Airlines, the fastest growing airline for several years after beginning service to PHL in 2004, worked with the city and the airport to expand and improve its facilities. Southwest recently built a joint ticket counter lobby for the D and E terminals, one large security check point for the two terminals and additional concessions. A hammerhead expansion to the E concourse was finished in February 2010. However, Southwest subsequently ended nonstop service to PHL from most of its non-focus cities due to competition with US Airways. The January 2013 lease extension obtained by US Airways was contingent on a number of future enhancements, and the lease renewal provided some funding. Philadelphia International Airport has seven terminal buildings, which are divided into six lettered concourses, which together contain 124 gates total. As of late November 2015, it is possible to walk to each terminal airside. Terminal F, completed in 2003, was originally not connected to the rest of the terminal complex, and gates could only be accessed by a separate TSA Security Checkpoint or by shuttle buses between Terminal F and Terminal C or between Terminal F and Terminal A. With the opening of the secure connector, these shuttle services remain. There is a large shopping/dining area between Concourses B and C. There are no luggage storage facilities at the airport. As part of Philadelphia International Airport's US$6.4 billion, 25-year airport expansion plans, an automated people mover will be built in coordination with projected airport growth through the 2020s and 2030s to move passengers between terminals. Terminal A is divided into two sections, east and west. Terminal A West contains 13 gates, whilst Terminal A East contains 11 gates. Terminal A West has a very modern and innovative design, made by Kohn Pedersen Fox, Pierce Goodwin Alexander & Linville and Kelly/Maiello. Opened in 2003 as the new international terminal, it is now home to American (domestic and international), British Airways, Icelandair, Lufthansa, and Qatar Airways. It offers a variety of international dining options. International Arrivals (except from locations with Customs preclearance) arrive at gates in both Terminal A east and west and are processed at the Terminal A West arrival building. Terminal A East, originally the airport's international terminal, is now used by Aer Lingus and American domestic and international flights as well as international arrivals for Frontier Airlines. A-East is well maintained and recently received an upgrade to its baggage claim facilities. Most of the gates in this terminal are equipped to handle international arrivals and the passengers are led to the customs facility in Terminal A West. It opened in 1990. The security entrance was significantly enlarged in 2012. There are 3 lounges located along the corridor between Terminal A East and A West; an American Airlines Admirals Club, British Airways Galleries Lounge and American Express Centurion Lounge. The east terminal also contains an Admirals Club. There is also a children's play area located in the east terminal. Terminals B and C contain 15 and 14 gates respectively. They are the two main terminals used by American. They were renovated at a cost of $135 million in 1998, which was designed by DPK&A Architects, LLP. They are connected by a shopping mall and food court named the Philadelphia Marketplace. Remodeling has begun in the gate areas, although these cosmetic changes will not solve the space problems at many of the gates. Overall, the facilities are fairly modern and dining options on the concourses are also available. They are the oldest terminals and opened in 1953. There is an American Airlines Admirals Club located in the B/C connector. Terminal D contains 16 gates. It originally opened in 1973. The terminal was upgraded in late 2008 with a new concourse connecting to Terminal E while providing combined security, a variety of shops and restaurants and a link between Baggage Claims D and E. This is the inverse of the connector between Terminals B and C, which comprises a combined ticket hall but separate security facilities. Terminal D is home to Air Canada, Alaska Airlines, Delta, and United. This terminal is connected to the shopping area of Terminals B/C through a post-security walkway. The terminal contains a United Club and a Delta Sky Club. Terminal E contains 17 gates. It is home to Frontier, JetBlue, Southwest, and Spirit. It opened in 1977. Terminal E houses a USO lounge available for all members of the military and their family. Terminal F contains 38 gates. The terminal is a regional terminal used by American Eagle flights. It includes special jet bridges that allow passengers to board regional jets without walking on the apron. Opened in 2001, Terminal F is the second newest terminal building at PHL. It was designed by Odell Associates, Inc. and The Sheward Partnership. An American Airlines Admirals Club is located above the central food court area of Terminal F.
When Terminal F opened in 2001, it contained 10,000 sq ft (930 m2) of space for concessions. SEPTA Regional Rail's Airport Line provides rail service to and from stations at Terminals A, B, C, D, and E. There are four stations located at Airport Terminal A East/West, Airport Terminal B, Airport Terminals C & D, and Airport Terminals E & F. The stations are located next to the baggage claim at each terminal with escalator and elevator access from each terminal's skywalk. The Airport Line provides passengers a connection between the airport, Center City Philadelphia, and other SEPTA trains, Amtrak trains, and NJ Transit trains at 30th Street Station. The Airport Line provides service through Center City Philadelphia to Glenside, PA. Many weekday trains and half of the weekend trains provide extended service to Warminster, PA along the Warminster Line. The Airport Line operates from 5:00 a.m. to 12:00 a.m. daily, with trains running every 30 minutes. The train ride from the airport to Center City Philadelphia takes 25 minutes. The Philadelphia International Airport has road access from an interchange with I-95, which heads north toward Center City Philadelphia and south into Delaware County. PA 291 heads northeast from the airport area and provides access to and from I-76 (Schuylkill Expressway). Rental cars are available through a number of companies; each operates a shuttle bus between its facility and the terminals. As part of the airport's expansion plan, the airport plans to construct a consolidated rental car facility. Taxis and ride-sharing services both serve the airport. SEPTA operates various bus routes to the airport: Route 37 (serving South Philadelphia and Chester Transportation Center), Route 108 (serving 69th Street Transportation Center and the UPS air hub), and Route 115 (serving Delaware County Community College and Darby Transportation Center). As a benefit to students, local schools including The University of Pennsylvania, Villanova University, Swarthmore College, Haverford College and Saint Joseph's University traditionally operate transportation shuttles to the airport during heavy travel periods such as spring and Thanksgiving breaks. On January 14, 1951, Flight 83 crashed upon landing at Philadelphia from Newark. The aircraft skidded off the runway, crashed through a fence and came to rest in a ditch. During the incident, the left wing broke off, rupturing the gas tanks and setting the plane on fire. There were seven fatalities in all. Frankie Housley, the lone stewardess on Flight 83, led ten passengers to safety but lost her life trying to save an infant. On February 7, 2006, a UPS Airlines Douglas DC-8 cargo plane suffered an in-flight cargo fire and made an emergency landing at Philadelphia International Airport after filling with smoke. There were no injuries other than smoke inhalation affecting the crew, but the plane burned on the ground for hours into the night, though most of the cargo survived, the aircraft was a total loss, with multiple holes burned through the roof skin. According to the NTSB, the firefighting crew did not have adequate training on using their skin-piercing extinguishing equipment and not knowing how to open the main cargo door, attempted to force the handle and broke the latch, rendering the door unopenable. There were also difficulties in obtaining the cargo manifest to determine what if any hazardous materials were on board, due to confusion about protocol. However, despite these failings, the airport staff, including the firefighting staff, managed the incident successfully without injury or major disruption of the airport. The NTSB suspected lithium ion batteries were the source of ignition and made recommendations for more stringent rules and restrictions on their air transport, especially on passenger aircraft (unlike this one). For a cause of the incident, the NTSB focused on the delayed indication of fire by the required onboard fire detection system and criticized the standards to which such systems are tested, noting that the tests use an empty cargo hold and do not represent the real-world performance of the detection systems with the hold full of cargo, which significantly changes the flow patterns of hot air and smoke. The crew and air traffic control personnel were found to have behaved properly (with minor exceptions) and not to be at fault for the incident or its outcome. On March 13, 2014, US Airways Flight 1702, an Airbus A320-214, rotated then aborted takeoff and as a result suffered a tailstrike and a nose landing gear collapse. The aircraft then continued down runway 27L coming to a stop off to the left of the runway. None of the 149 passengers and 5 crew members suffered life-threatening injuries. However the aircraft saw substantial damage and was later written off and scrapped. The accident was found to be pilot error and since neither the captain nor first officer has flown commercially. On April 17, 2018, Southwest Airlines Flight 1380, a Boeing 737-700 en route from New York to Dallas, suffered an engine failure on its left engine. Debris from the engine struck the aircraft's fuselage and a side window. The window failed, causing a rapid depressurization of the aircraft, which made an emergency descent and diverted to land at Philadelphia International Airport. One passenger died after being partially ejected from the failed window. Seven others were injured and treated locally at the airport. ^ "Aviation Activity Report City of Philadelphia Month and Year - December 2017" (PDF). PHL Airport. Retrieved February 13, 2018. ^ a b FAA Airport Master Record for PHL (Form 5010 PDF), effective February 1, 2018. ^ "Manta - The Place for Small Business". Manta. ^ "Air Force History Index -- Search". ^ "1960s -1970s". Archived from the original on June 22, 2012. ^ "Not the Master Planner". Engineering News-Record. McGraw-Hill. 195 (14): 15. Retrieved June 15, 2012. ^ a b c Blumenthal, Jeff (January 22, 2013). "US Airways Renews Lease at Philadelphia International Airport, Eyes Improvements". Philadelphia Business Journal. Retrieved January 27, 2013. ^ Klimkiewicz, Joann. "New Airport Terminal Runs Into Legal Fight A Court Challenge By A Property Owner Could Delay The Opening Of Us Airways' $325 Million Terminal One." Philadelphia Inquirer. April 28, 2000. Retrieved on August 22, 2013. ^ Klimkiewicz, Joann. "Airport Is Denied Purchase Of Land Phila. International Wants To Expand. Tinicum Fears Noise Pollution And The Loss Of Tax Revenues." Philadelphia Inquirer. February 23, 2000. Retrieved on August 22, 2013. ^ Hogate, Jayanne (June 28, 2002). "Pennsylvania Gov. Schweiker Cuts Ribbon to Open New I-95 Ramps To Philadelphia International Airport". Pennsylvania Office of the Governor. Retrieved December 2, 2015. ^ Gelbart, Marcia (April 27, 2003). "New gateway to the world The international terminal opens Friday". The Philadelphia Inquirer. Retrieved December 2, 2015. ^ "Capacity Enhancement Program EIS". ^ "Tinicum crying foul on new airport runway". ^ "Passenger Traffic 2004 FINAL". Airports Council International. Archived from the original on January 3, 2006. Retrieved January 3, 2005. ^ "Airport Continues to Attract Record Numbers of Passengers" (Press release). Philadelphia Airport System. August 15, 2005. Archived from the original on February 8, 2012. Retrieved August 15, 2005. ^ "Passenger Traffic 2006 FINAL". Airports Council International. July 18, 2007. Archived from the original on September 30, 2007. Retrieved July 30, 2007. ^ Gelbart, Marcia (June 29, 2005). "Southwest Fuels Takeoff of Income From Parking". The Philadelphia Inquirer. Retrieved March 27, 2013. ^ "Agreement for PHL Airport expansion reached, Tinicum homes to remain". Philly.com. May 5, 2014. ^ "Terminal E Has a Brand New Look at Philadelphia International Airport" (Press release). Philadelphia Airport System. February 16, 2010. Archived from the original on March 2, 2012. Retrieved February 18, 2010. ^ "Passenger Info". Archived from the original on December 23, 2015. ^ "Philadelphia International Airport (PHL/KPHL), PA". Airport Technology. ^ Belden, Tom (April 2, 1998). "Us Airways, Phila. Agree on Adding Two Terminals Overseas, Commuter Flights The Focus of A$400 Million Plan". The Philadelphia Inquirer. Retrieved June 12, 2012. ^ "Philadelphia International Airport – Press Release". Archived from the original on February 5, 2009. ^ "Welcome to SEPTA - Philadelphia International Airport". SEPTA. Retrieved October 18, 2018. ^ "Airport Line schedule" (PDF). SEPTA. Retrieved October 18, 2018. 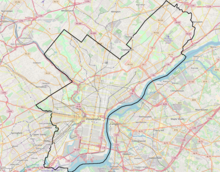 ^ Metro Philadelphia, Pennsylvania (Map) (19th ed.). 1"=2000'. ADC Map. 2006. ISBN 978-0-87530-777-0. ^ "Ride with Uber - Philadelphia International Airport (PHL)". Uber. Retrieved April 10, 2018. ^ "Lyft at Philadelphia International Airport". Lyft. Retrieved April 10, 2018. ^ "Flight Schedules". Retrieved May 22, 2017. ^ "American Airlines Expands European Footprint and Modifies Asia Service". American Airlines. Retrieved August 21, 2018. ^ a b Hilario, Kenneth. "American Airlines to add N.C. & Tenn. flights from PHL in 2019". Retrieved November 1, 2018. ^ "Frontier". Retrieved September 19, 2017. ^ "Route Map/Timetable Search". Retrieved March 28, 2017. ^ "Route Map & Flight Schedule". Retrieved January 28, 2017. ^ "RITA - BTS - Transtats". December 2018. Retrieved April 11, 2019. ^ "BTS Air Carriers : T-100 International Market (All Carriers)". Retrieved June 14, 2018. ^ "PHL Fast Facts" (PDF). Philadelphia International Airport. Retrieved March 20, 2019. ^ "Activity Reports". Archived from the original on March 30, 2015. ^ "Fire Forces UPS Plane to Make Emergency Landing". CNN. February 8, 2006. Retrieved March 27, 2013. ^ "Inflight Cargo Fire United Parcel Service Company Flight 1307 McDonnell Douglas CS-8-71F, N748UP". National Transportation Safety Board. February 7, 2006. Retrieved March 27, 2013. 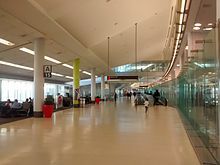 Wikimedia Commons has media related to Philadelphia International Airport. 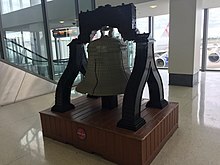 Wikivoyage has a travel guide for Philadelphia International Airport.